Following knee and hip surgery, weakening of the muscles around these joints is a common occurrence. If you want to minimize stiffness of muscles, and increase mobility and muscle tone, get an EZ Mend Knee and Hip Rehabilitation Device. This device may assist after knee and hip surgery, sports injuries and for nursing home patients. The EZ Mend can be used on a bed, on the floor or anywhere that you may be sitting. Instructions for Knee and Hip Recovery: 1) Sit lengthwise on your bed and position one end of the EZMEND under your thigh, parallel to your leg. 2) Wrap the soft strip around the instep of your foot. 3) Place your heel into the EZMEND cup and lay back into a horizontal position. 4) Grasp one end of the soft strip in each hand and slowly pull your leg along the EZMEND towards your chest. Hold your knee in this position for 5-10 seconds, and then straighten. Rest when fatigued. 5) Repeat this procedure following the directions and supervision of your doctor or physiotherapist. More exercises are included in the Instructional Pamphlet that is included with the EZ Mend Knee and Hip Rehabilitation Device. 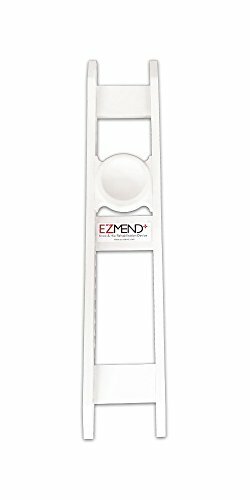 EZMEND can help as you begin to exercise your joints after surgery, as it is a non-weight bearing exercise device. It is important that you begin to exercise your joints following surgery, under your surgeon's supervision, to help restore range of motion and strength. Orthopedic surgeons and physiotherapists recommend EZMEND to help restore mobility and strength, to promote a faster and simpler recovery. EZMEND Knee and Hip Rehabilitation Device has been registered with Health Canada and the FDA. This new product is covered by many Health Insurance or Health benefit providers. Engineered to improve circulation, increase your range of motion, strengthen muscles, diminish post operative pain and reduce swelling. 100% latex free, soft non-elastic fabric strip and instructions are included with every EZ Mend board. Instructions are in English, French and Spanish. An instructional video is available on our web site www.ez-mend.com. The EZ Mend device does not require batteries or the use of electricity, it may be cleaned using a household or commercial disinfectant. The soft fabric strip is machine washable. If you have any questions about this product by Smyth & Hart Medical Innovations, contact us by completing and submitting the form below. If you are looking for a specif part number, please include it with your message.